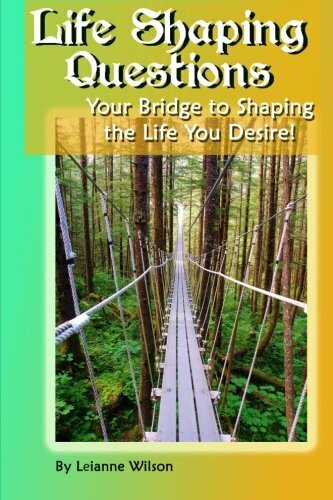 Life Shaping Questions: Your bridge to shaping the life you desire! These are the Questions forming your future. Cross the bridge to shaping your life! This is the book that creates your bridge to shaping the life you desire! It’s about learning how to consciously shape your life! You have the power to shape your life! Now learn to use it! Wouldn't it make a difference if you realized what you think and feel is shaping your life now? Wouldn’t it make a difference if you knew how to think and feel to shape your life into what you desire? Every question in this book, leads you on a journey of getting clearer on how to influence life and shape it into more of what you desire. Your answers to this series of questions will give you the freedom to be you – living a life of choice, excitement, stimulation, growth and fulfillment. A set of techniques to get you in touch and clear on any issue you face and how to turn it around. Using this set of questions will begin to powerfully and deliberately shape your future. The questions bring you out of habits and patterns that keep you stuck. Your answers will lead you to divine guidance, wisdom, solutions and freedom to live the life you want. A set of questions that you can apply to any situation or circumstance in your life and learn how to use your power to turn things your way. Your answers to these questions will get you outside of the stress and drama in your life and into fulfilling successful solutions. A guide book leading you across the bridge to your Inner Power. It will spell out for you chapter by chapter, each question and how to use it consciously so that you can deliberately design, create and experience shaping your future. How it is possible for you to shape your life and use your true source of power. That you can influence energy… which is everything. How to deliberately use your power to influence energy. What you are up against in shaping your life. Become aware of how you are unconsciously using your power already. What has been shaping your life up until now, without you realizing it. How you get stuck in patterns that prevent you from shaping life as you will. The trap you end up in that has you saying “this always happens”. How to turn things around so you’re creating your future. The incredible resource within you that can guide you through any life change. What life is really “all about” and the secret to turning any situation around. They key to unleashing powerful transformation in your life. How to make the shift into consciously and deliberately shaping your life. The powerful difference between “wanting” and “desiring”, and how to use it. Why creativity isn’t just for artists and is the key ingredient to shaping your life. How to develop a Creative Solution that increases your ability to get what you desire. Learning to read life’s clues as a guide to experiencing what you desire. The Life Shaping Activity E-Book is a downloadable workbook and journal combined with narrative audio, video, downloadable mp3 guided meditations and easy to use worksheets that captures your LIFE SHAPING QUESTIONS journey. It is the perfect compliment to make your journey easy and fun!